For years scientists have been tracking animals and the ways they migrate. 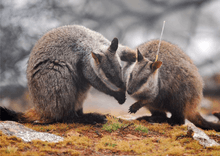 One of the many goals of animal migration research has been to determine where the animals are going; however, researchers also want to know why they are going "there". Researchers not only look at the animals' migration but also what is between point a and point b to determine if a species is moving to new locations based on food density, a change in water temperature, and the animal's ability to adapt to these changes. A monarch butterfly shortly after tagging at the Cape May Bird Observatory. The Observatory is one of the organisation that has a monarch identification tagging program. 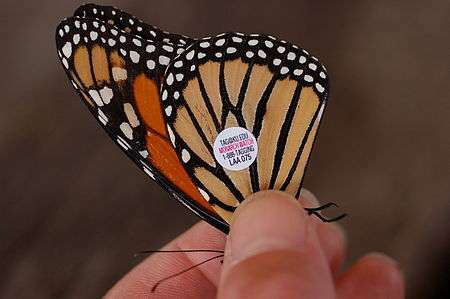 Plastic stickers are placed on the wing of the insect with identification information. Tracking information is used to study the migration patterns of monarchs, including how far and where they fly. In the fall of 1803, American Naturalist John James Audubon wondered whether migrating birds returned to the same place each year. So he tied a string around the leg of a bird before it flew south. The following spring, Audubon saw the bird had indeed come back. Scientists today still attach tags, such as metal bands, to track movement of animals. 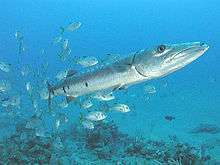 Metal bands require the re-capture of animals for the scientists to gather data; the data is thus limited to the animal's release and destination points. Recent technologies have helped solve this problem. Some electronic tags give off repeating signals that are picked up by radio devices or satellites while other electronic tags could include archival tags (or data loggers). Scientists can track the locations and movement of the tagged animals without recapturing them using this RFID technology or satellites. These electronic tags can provide a great deal of data. However, they are more expensive than the low-tech tags that aren't electronic. Also, because of their size and weight, electronic tags may create drag on some animals, slowing them down. The right one of these two brush-tailed rock-wallabies is wearing a radio tracking collar. Tracking an animal by radio involves two devices. A transmitter attached to the animals sends out a signal in the form of radio waves, just as a radio station does. A scientist might place the transmitter around an animal's ankle, neck, wing, carapace, or dorsal fin. Alternatively, they may surgically implant it as internal radio transmitters have the advantage of remaining intact and functioning longer than traditional attachments, being protected from environmental variables and wear. A VHF receiver picks up the signal, just like a home radio picks up a station's signal. The receiver is usually in a truck, an ATV, or an airplane. To keep track of the signal, the scientist follows the animal using the receiver. This approach of using radio tracking can be used to track the animal manually but is also used when animals are equipped with other payloads. The receiver is used to home in on the animal to get the payload back. Receivers can be placed in Earth-orbiting satellites such as ARGOS. 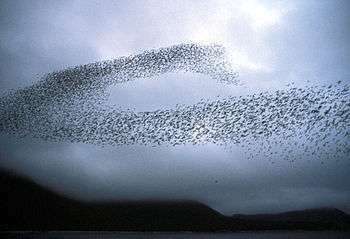 Networks, or groups, of satellites are used to track animals. Each satellite in a network picks up electronic signals from a transmitter on an animal. Together, the signals from all satellites determine the precise location of the animal. The satellites also track the animal's path as it moves. Satellite-received transmitters fitted to animals can also provide information about the animals' physiological characteristics (e.g. temperature) and habitat use. Satellite tracking is especially useful because the scientists do not have to follow after the animal nor do they have to recover the tag to get the data on where the animal is going or has gone. 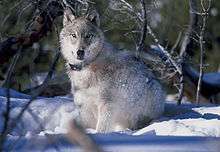 Satellite networks have tracked the migration and territorial movements of caribou, sea turtles, whales, great white sharks, seals, elephants, bald eagles, ospreys and vultures. 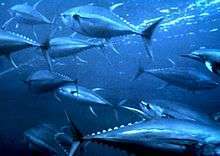 Additionally Pop-up satellite archival tags are used on marine mammals and various species of fish. There are two main systems, the above-mentioned Argos and the GPS. Thanks to these systems, conservationists can find the key sites for migratory species. Electronic tags are giving scientists a complete, accurate picture of migration patterns. For example, when scientists used radio transmitters to track one herd of caribou, they learned two important things. First, they learned that the herd moves much more than previously thought. Second, they learned that each year the herd returns to about the same place to give birth. This information would have been difficult or impossible to obtain with "low tech" tags. Tracking migrations is an important tool to better understand and protect species. For example, Florida manatees are an endangered species, and therefore they need protection. Radio tracking showed that Florida manatees may travel as far as Rhode Island when they migrate. This information suggests that the manatees may need protection along much of the Atlantic Coast of the United States. Previously, protection efforts focused mainly in the Florida area. 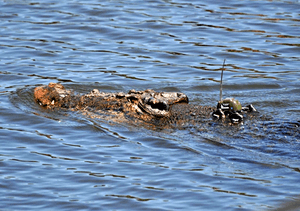 In the wake of the BP oil spill, efforts in tracking animals has increased in the Gulf. Most researchers who use electronic tags have only a few options: pop-up satellite tags, archival tags, or satellite tags. Historically these tags were generally expensive and could cost several thousands of dollars per tag. However, with current advancements in technology prices are now allowing researchers to tag more animals. 1 2 Gavashelishvili, A.; McGrady, M. J. (2007). "Radio-satellite telemetry of a territorial Bearded Vulture Gypaetus barbatus in the Caucasus". Vulture News. 56: 4–13. ↑ Gavashelishvili, A.; McGrady, M.; Ghasabian, M.; Bildstein, K. L. (2012). "Movements and habitat use by immature Cinereous Vultures (Aegypius monachus) from the Caucasus". Bird Study. iFirst: 1–14. doi:10.1080/00063657.2012.728194. Tomkiewicz, Jr, Stanley. "Tracking animal Wild life." telonics. Zanoni, Mary. "Animal ID." Klamath Basin. "John James Audubon." Audubon. National Audubon Society, Inc.
"Satellite Tracking Migratory Birds." Western Ecological Research Center. "Satellite Tracking Threatened Manatees." Space Today. "Tracking Manatee Movement." Save The Manatee Club. "Manatee Migration Updates." Journey North. Learner. Radio interview Robert and Kirk Miner remember their grandfather, Jack Miner, and talk about the Jack Miner Migratory Bird Sanctuary. Originally aired February 1, 2008.